We recently switched to Right Start Math. I went with Level A, knowing that some parts would not prove challenging to Curly, but hoping that Tiger could tag along some. Well, it was a great decision and we are loving Right Start. I ordered the full kit that came with all the copies made and all the little manipulatives. I put everything in a tub and I pull it all out at math time. The lessons are open-and-go for me and don’t require any advanced planning. I LOVE that! It’s also fairly scripted so I know what I’m doing. It even gives some teacher’s notes throughout the lessons to explain why you are teaching a certain concept. At first, I thought some of the exercises were too simple. I’ll say a number; you say the number that comes before. Or I’ll tap a pattern and you tell me how many taps you heard. Or I’ll build numbers on the abacus and you tell me what they are. Or We’ll skip count using the abacus so you can see what numbers we are counting. Well, I was wrong to think these activities were too simple or did not serve a purpose. Curly’s mental math is amazing me every day. I cannot believe what she has learned through our simple math games and using the abacus and other manipulatives. Even Tiger is catching on and doing some addition in his head. He is even understanding the concept behind addition. The Right Start Lessons are somewhat spiral. You begin with a review. You move into the lesson (which could be done in 2 parts on 2 days if needed). The lesson often introduces more than one concept. Then you often end with a game or other activity on most days. I didn’t realize how much we would enjoy a gentle spiral program rather than a program that was strictly mastery-based. Having new concepts thrown in has reinforced older concepts and has given us some much-needed variety in math time. Tiger and Curly love the math games and think they are so fun. They ask to play them daily. I thought some of the games were fairly simple but they continually want to play them and I can see how much the games have improved their mental math abilities. 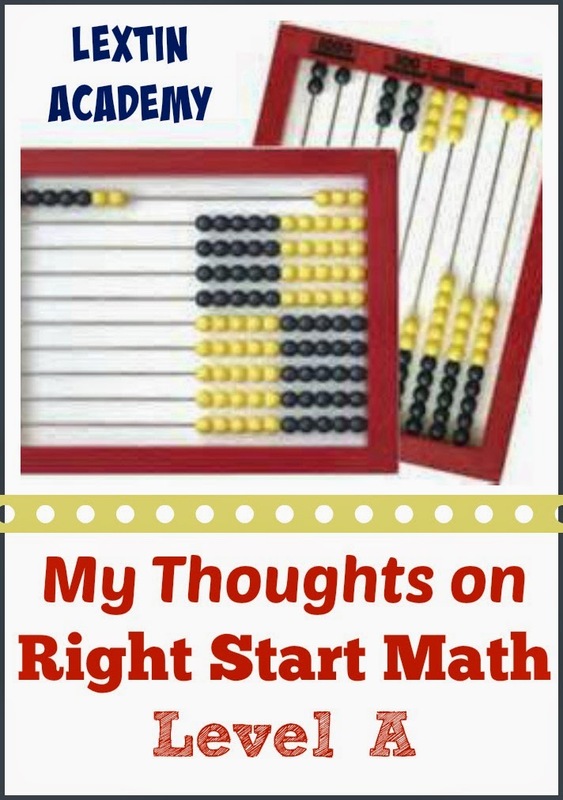 Right Start has shown me several ways of looking at the same concept and I feel like I am a much better math teacher. And I won’t lie, the manipulatives and all the fun doo-dads are exactly what we need right now. Yes, it’s more stuff to store and keep up with, but it is so fun and keeps each lesson fresh. We hope to finish Level A this year and then take our time moving through Level B. I’ll take Tiger back through A either next year or the following year as he masters everything on his own. Right now he’s just picking up some of the concepts as he listens to Curly. Linked up with the other bloggers at the Hip Homeschool Hop! I see that you say you “switched to RSM”. I’m curious to know what you used prior and what grade your child completed prior to the switch. I just purchased RSM levels A & B. My son has just completed kindergarten but he did 1st grade Saxon math. I’m trying to figure out if he should go to level B or start over at level A. We were using Math-U-See before we switched. My daughter had completed Primer and most of Alpha. When we switched she was at the end of 1st grade. I put her back in Level A to help build her confidence in math because she was so frustrated and confused. If you’re using second edition Right Start Math then Level A is slightly more advanced and covers more topics. However, many people are able to successfully start in Level B because it has great review. I started in Level A because I wanted my daughter to understand the Right Start method and how to use the abacus. I wanted to make sure she was confident with our new math tools before moving forward. Plus, I had never used an abacus so I wanted lots of review and hand-holding for me as well. You could try using A and see what he thinks. You could do two lessons a day and move through it more quickly and then go into B. Or you could try B and see if he’s able to keep up – if he’s not then you could place him back in A. My daughter started out “behind” in Right Start but by the end of Level C had caught up to where I wanted her to be. The Right Start method made so much sense to her! I love it!